Rock icons - Irish group "U 2" deservedly won the prize for Best Live Act after a concert in front of Brandenburg Gate. Germany rockers from "Tokio Hotel" are honored in the category of Best Group while Placebo cinched Best Alternative. The award for Best New Act winning American singer Lady Gaga. Hip hop star Eminem won Best Male and Turkish hip hop/rock group maNga carried off the crown for Best European Act. Best World Stage Performance and Best Push Act, were won by Linkin Park and Pixie Lott respectively. 1. Singer Beyonce celebrates winning the Best Video award onstage during the 2009 MTV Europe Music Awards held at the O2 Arena on November 5, 2009 in Berlin, Germany. 2. L-R Mike Dirnt, Billy Joel Armstrong and Tre Cool of Green Day arrive for the 2009 MTV Europe Music Awards held at the O2 Arena on November 5, 2009 in Berlin, Germany. 3. 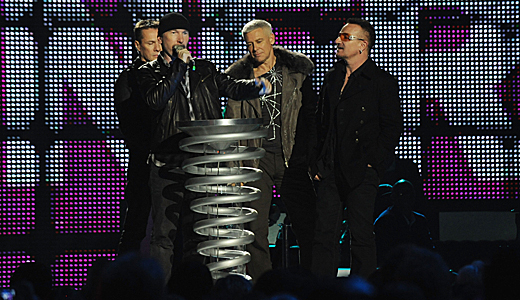 The Edge of U2 speaks on stage as they receive the Best Live Act award during the 2009 MTV Europe Music Awards held at the O2 Arena on November 5, 2009 in Berlin, Germany.